But not just any salsa will do. Really fresh salsa with cilantro, onions and garlic. So when I was faced with an ever growing mound of tomatoes from our garden and a daily meal of caprese just wasn't putting a dent it in, there was really only one thing to do: Make Salsa. It is so wonderful!! I'm making more tonight. . .
And, we'll see some of that at the office, right? Mmm… I love homemade salsa, too! 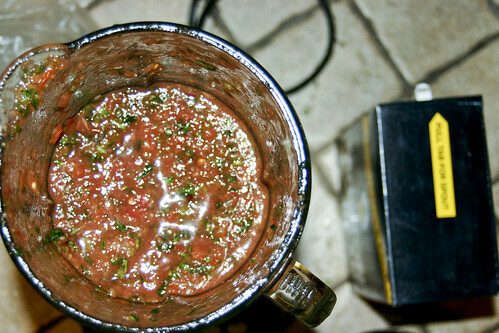 Jason makes some stellar red salsa and tomatillo salsa. A Mexican friend of ours told us that they stew the tomatoes first to enhance the flavors (or you can by canned tomatoes that have been soaking in juice for a while). I hear ya on using up the yummy fresh tomatoes though! I have a great Tomato Basil Soup recipe that uses fresh tomatoes. let me know if you're interested! :) I've also been told you can fresh tomatose if you plan to cook them later (for sauce or soup or whatever). Homemade salsa totally blows the storebought stuff out of the water - perfect way to celebrate the flavors of summer! Yummy! Would you mind sharing that recipe with me? Looks great!